Changing quickly between guitar chords, so they are clean and smooth, is the key to making the songs you play on your guitar sound great. This is a fundamental skill that doesn’t call for hard work, although it does require some time and attention in the beginning. It is a process that cannot be rushed however, when you follow and practice the instructions below – daily, you will begin to see results quickly. The effort required for clean and swift chord changes, is usually why most beginning guitar players choose to adopt the ‘close enough is good enough’ theory. Make sure there is a gap between the palm of your hand and the guitar neck so you are not touching (muting) the thin E string. Place down all your fingers at the same time back into the position of the chord. It is vitally important to do this! It is normal that your fingers will want to come down one at a time to begin with. Mentally tell yourself to place all your fingers down together will gradually make this easier. Getting your fingers to come down, at the same time, is a key step in getting smooth and clean chord changes. Repeat the above two steps for another four times for a total of five repetitions. When you place down your fingers for the fifth time, press a lot harder than you normally would fretting the chord and hold for 10 seconds. Repeat steps 1, 2 and 3 for the A minor chord. Make sure you do all these moves SLOWLY as this helps build the much needed hand strength and muscle memory. Repeat steps 1-3 for a total of five times. For the next step repeat the same above Lift off/ Place down technique. This time however, you will liftoff one chord, and then move your fingers into the next chord shape. Before placing your fingers down into the second chord shape though, hover over the chord shape before you place downall fingers togetheronto the next chord. Steps four and five will explain exactly how to do this. Hold E minor chord in position – lift off – change and hover your fingers over the Am chord before you place downall your fingers together into the A minor chord. Lift off A minor chord – change and hover your fingers first over the E minor chord – place down all fingers together into E minor chord. Repeat back and forth SLOWLY between both chords for 2 minutes. Get yourself a countdown timer to do this. At this stage, your fretting hand maybe feeling sore, tight or even fatigued. This is completely normal to begin with. Give your hands a rest if this is the case. By doing these steps daily you will gradually build up the strength in your hands. For the next step you will continue with the same two chords but you will add your strumming hand. You will be actively listening to how each chord sounds now. Hold down E minor and strum all the strings (string 6 through to string 1) with your strumming hand once only. Now change to the A minor (hover then place fingers down together). With your fingers in place, strum (strings 5 through 1) for the A minor chord once only. Now repeat this by going back and forth between the two chords. Once you have completed the seven steps, choose two different chords. Work through them as you have just done. Then repeat all the above exercises with all the chords you know. Mix up the chords in any order. This will prepare you for changing into and out of chords as you would in songs. Make the commitment to yourself to practice chord changes for five to ten minutes daily. 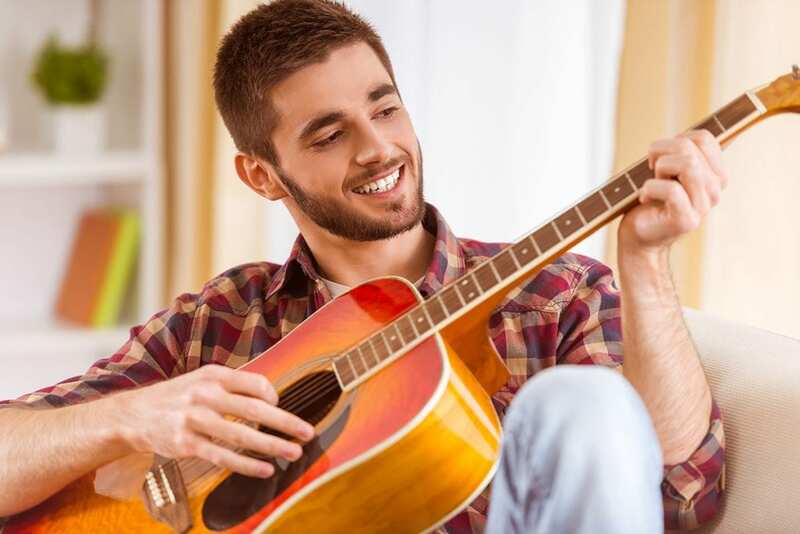 Knowing, and practicing the above steps, you are training yourself to become a better guitar player. Happy practicing! About the author: For over three decades, after having picked up at guitar at the age of thirteen, Allen Hopgood has played countless gigs playing straight ahead rock, blues, pop songs and jazz standards. He continues to refine his chops everyday while running his very own guitar school in the Gold Coast areaof Australia.